where the cool cats hang out. You know when you had just the best weekend and cherished every moment of it? Yeah, currently how I’m still feeling on this Tuesday morning. Weekends are usually full of commitments, but every once in a while, you’re gifted a weekend without plans. These weekends you get to do what you want to do (what a concept!) and I couldn’t have had a better few days. Between hanging friends I hadn’t seen in too long, spending the whole day with my husband celebrating #ClearTheShelters Day, and taking photos with Alive Rescue, it was sort of my dream weekend. If only carbs didn’t have calories, then it would have been perfect. It all starting though on Friday afternoon when I popped in to visit the newest (and technically first) cat cafe in Chicago, CatCade. I was lucky enough to get a sneak peek before they officially opened their doors this past Saturday. 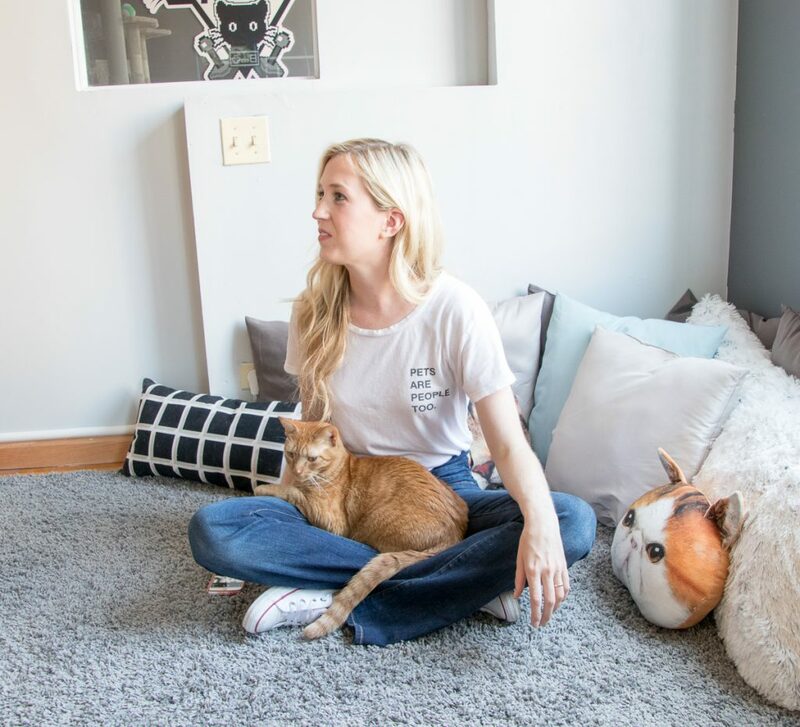 Shelly and Chris, the founders of the non-profit arcade catering to cat lovers, couldn’t be nicer or more knowledgeable of all things feline. They began traveling and visiting cat cafes of over the world and finally realized they could combine all the best aspects and bring one back to their hometown of Chicago. Considering all I knew about cat cafes was based on Sosh’s experience from Girls, I am super happy they decided to open one right in my backyard. 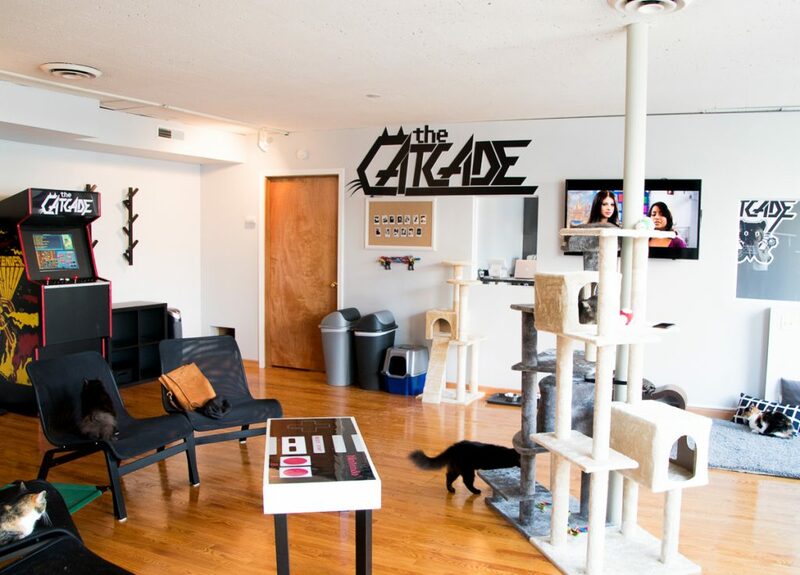 Before visiting the CatCade, you are encouraged to make a reservation online for a one-hour time slot. This is so you will be able to interact with more cats and fewer humans. They do take walk-ins, but you risk needing to wait your turn. You can visit for up to one hour (and possibly longer) with a $15 donation.I was too busy spending time with Leo and Paulina to enjoy the arcade games, but they have three machines loaded with plenty of games. You’re also welcome to purchase a bottled or canned beverage to sip on while giving unlimited chin scratches. It felt as if I was back in junior high, hanging out at a friends house and playing with their 13, yes 13, cats. 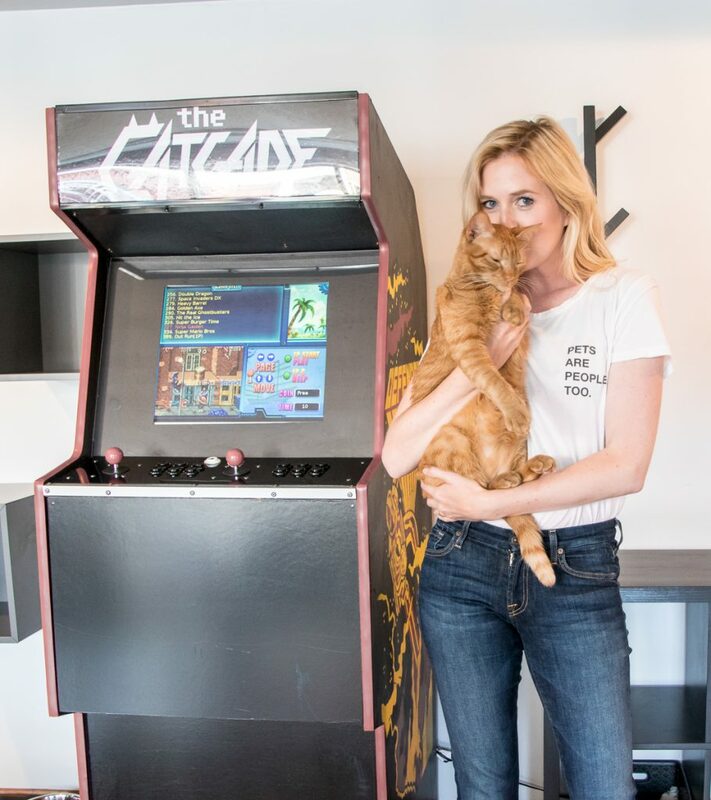 While the arcade, flatscreen TV, and drinks all fun, in reality, the CatCade is really a rescue. 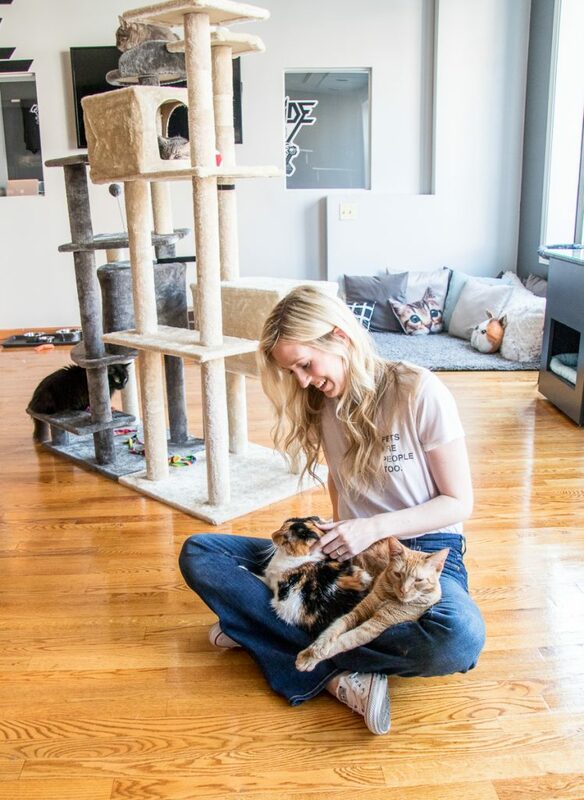 All the feline residents are available for same-day adoption and if you do take home a new friend, your $15 donation goes towards the adoption fee. 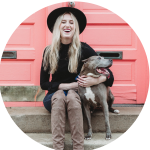 They collaborate with shelters across the city and have worked closely with Canines and Felines to develop a well thought out system. The best part of the CatCade is living-room model they provide for the cats. I loved how all the cats were able to roam freely and come visit with you when they wanted. When you go to a shelter, it’s often your choice as to who you want to interact with. This can cause you to overlook a cat due to color or age…this eliminates that. For example, I normally would have approached the black fluffy cats that were so cute and outgoing and most certainly mischievous. However, when I sat down, a five-year-old lady who was described as slightly cranky snuggled right into my lap, curled up, and fell asleep. I immediately considered repercussions of bringing home a third cat, but I appreciate my marriage enough to know my boundaries…I think. 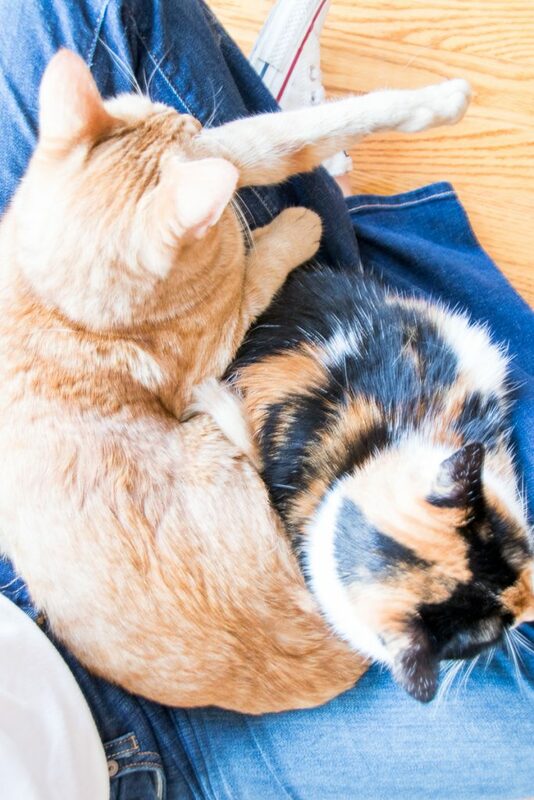 Another cool aspect is that you can see how these cats will interact in a home environment. Whether they’ll want to be snuggled with you or prefer to be chasing tails and cat toys. It’s was a glimpse into real life that can be hard to imagine in a traditional shelter setting. I will definitely be adding the CatCade to my list of weekend activities when the rare free one comes along. If you are in Chicago and looking for something to do, head over and see for yourself how fun it is! Be sure to tag me in your photos so I can tell you how jealous I am. 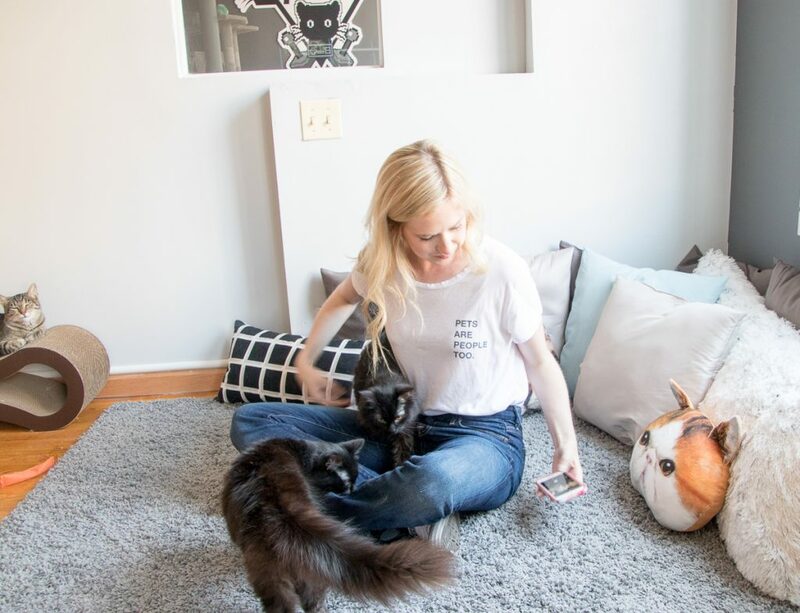 Have you ever been to a cat cafe?? Let me know in the comments below! There were so many feline friends to play with and each are purrfect (had to) in their own way. The two that warmed my heart the most though were Leo and Paulina. Paulina is about 5 years old and was dropped off in a box at Canines and Felines. She came in with a sibling and would be happy in almost any home. She’s cranky if you disturb her nap so please let her sit in peace and quiet until she’s ready to leave your lap, thanks. Leo is an Orange Tabby that loves to get into trouble but is also the sweetest thing. He reminded me a lot of my Cheese and that wasn’t just because of his color. He’s curious and needs to know what is going on, but once he’s satisfied that he’s in charge, he’ll plop down in your lap and fall asleep for hours. Catcade will soon have the bios of both of these guys up online, but for now, you can email them at info(at)thecatcade.org for more information. You’ve seen this shirt before but I can’t stop wearing it. Good hYouman is a brand that creates shirts and gives back to the community. 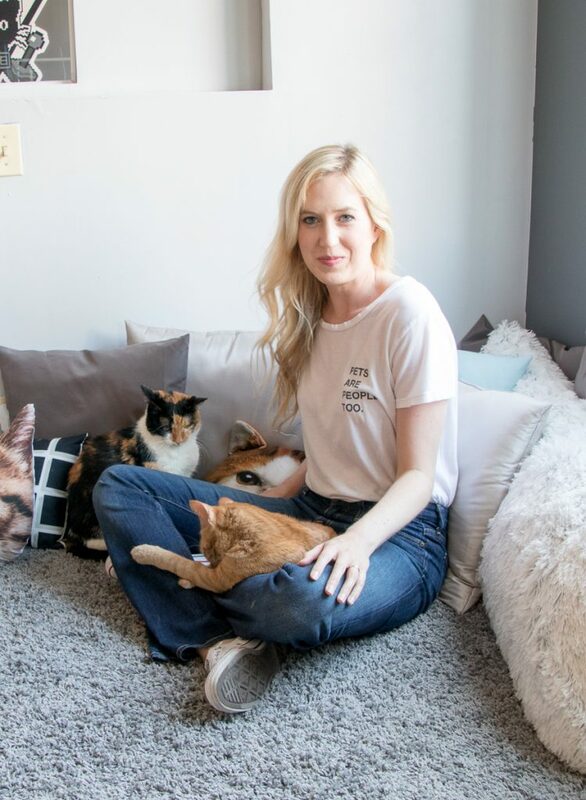 Their “Pets are People Too” shirt is one of my favorites. Also, boot cut jeans. But I’m here to tell you they’re coming back so if you’ve held onto yours for this long, don’t throw them away yet. Love it or hate it, Gisele Bundchen is doing it so you know it’s a matter of time. I kept it casual and opted for my converse, shop the look below!